We’d love your help. Let us know what’s wrong with this preview of Piglettes by Clémentine Beauvais. Awarded the Gold, Silver and Bronze trotters after a vote by their classmates on Facebook, Mireille, Astrid and Hakima are officially the three ugliest girls in their school, but does that mean they're going to sit around crying about it? Well... yes, a bit, but not for long! Climbing aboard their bikes, the trio set off on a summer roadtrip to Paris, their goal: a garden p Awarded the Gold, Silver and Bronze trotters after a vote by their classmates on Facebook, Mireille, Astrid and Hakima are officially the three ugliest girls in their school, but does that mean they're going to sit around crying about it? To ask other readers questions about Piglettes, please sign up. I loved the Sesame Seade series, a hilarious and smart middle grade mystery trilogy from Clémentine Beauvais. Piglettes shows us (as if we didn't already know) that Clém has a unique voice in fiction. This is her first YA novel, translated into English (by herself, I might add) from her 2015 French novel, Les Petites Reines. Piglettes takes us on an unlikely adventure with three witty, quirky and smart protagonists, like the ones featured in her younger fiction. But now Clém's used her writing I loved the Sesame Seade series, a hilarious and smart middle grade mystery trilogy from Clémentine Beauvais. Piglettes shows us (as if we didn't already know) that Clém has a unique voice in fiction. This is her first YA novel, translated into English (by herself, I might add) from her 2015 French novel, Les Petites Reines. Piglettes takes us on an unlikely adventure with three witty, quirky and smart protagonists, like the ones featured in her younger fiction. But now Clém's used her writing powers to create a YA read that you won't feel like you've read before. Mireille, Astrid and Hakima have been voted the three ugliest girls in their school. Awful, right? If it were me, I'd hide under my duvet forever, but these new friends band together and take matters into their own hands. From bullies and bicycles to periods and politicians, you never know what to expect next in Piglettes. The girls set off (slowly) on their bikes to Paris with a plan to crash a garden party at the Elysee Palace on 14th July. This bonkers adventure attracts interest from the French press and a wave of support on social media, leaving you cheering for the Piglettes. This is funny, coming of age YA book about today’s world where girls (any person) are judged by their face, size and shape. it's about 3 ugly girls facing bullies at school, their growing friendship, and travel of course. I liked tone of the book, I was laughing right from the beginning. Overall, this is intriguing, light and easy read. Teens would love it. We have 3 girls that go to the same school and all 3 are the finalists of the Pig Pageant contests that take place in Facebook and it is run by all students that go that school. If you have no idea that Pig Pageant is in short it is a cyber bullying kind of ''game'' that students do the pick up the 3 most ugly and fat girls in the school... Awesome right? This premise got me intrigued and I thought oh wow this would be a very deep and heartfelt read and there is diversity and stuff... I will get to that point now these 3 girls eventually become friends we have Mireille which is basically the ''team leader'' of the 3 Astrid the winner of the contest that has recently moved to the city and Hakima that is Arabic I guess so yeah there is a lot of diversity and this is one of the main reasons why I was expecting so much from this book. And they decide to go on the adventure of their life from their town sorry I forgot it too complicated to remember to Paris by bike! That would be 7 days of cycling. Each one of them has her reasons to go to Paris and these reasons happen to intersect at the same time at the same place in Paris. Now I don't even know where to begin with. At the beginning it was OK there were some funny parts but then it stroke me why the hell is Mireille being such a b*tch with her mother... Like hellooo you are just 15 could you just shut the f* up and stop barking back at your mother and asking her why did she sleep with an ugly man like your father... Like girl you got some issues and you need a psychologist. I get that you are upset and you do not feel alright with your self, but what the hell and her mother is just taking it as if it something normal.. No I AM NOT OK WITH THIS ATTITUDE! SORRY FOLKS. Je vous recommande totalement la lecture de cette merveilleuse petite tranche de vie d’adolescentes que la nature a peu gâtées physiquement mais qui ont réussi à se faire néanmoins une place au soleil avec une bonne dose de rêves et de volonté. La plupart du récit se déroule au début du mois de juillet, puisque le but de Mireille et de ses deux copines, Hakima et Astrid, est d’arriver à l’Elysée pour la Garden party du 14 juillet….Il est donc fortement conseillé de le lire en période estivale (j Je vous recommande totalement la lecture de cette merveilleuse petite tranche de vie d’adolescentes que la nature a peu gâtées physiquement mais qui ont réussi à se faire néanmoins une place au soleil avec une bonne dose de rêves et de volonté. La plupart du récit se déroule au début du mois de juillet, puisque le but de Mireille et de ses deux copines, Hakima et Astrid, est d’arriver à l’Elysée pour la Garden party du 14 juillet….Il est donc fortement conseillé de le lire en période estivale (juin/juillet, c’est parfait !) et je vous parie que cela vous donnera même des envies de sortir votre vélo du garage…En tout cas, bravo à l’auteure Clémentine Beauvais, qui, par le bais de Mireille, son héroïne truculente, a réussi à renverser la vapeur et à montrer à toutes et à tous que les filles dites « pas belles » ont aussi droit au respect et que finalement, les plus ridicules ce sont bien les gens qui jugent les autres sur leur apparence physique ! Ce livre est à recommander aux ados, notamment ceux qui sont mal dans leur peau. Vive Mireille, Hakima, Kader et Astrid….Et le vélo, et….Le boudin ! This book — Piglettes in English — is what I call a good surprise. A really good one. I hadn't expected to like this book as much as I did. Three girls — Mireille, Astrid, and Hakima — find themselves being awarded the Gold, Silver and Bronze trotters by their classmates after a vote took place on this Facebook. For Mireille, it's her third time, and the fact that the guy who created this award was once her childhood best friend is something she cannot let go of. These three girls decide to go to This book — Piglettes in English — is what I call a good surprise. A really good one. I hadn't expected to like this book as much as I did. Three girls — Mireille, Astrid, and Hakima — find themselves being awarded the Gold, Silver and Bronze trotters by their classmates after a vote took place on this Facebook. For Mireille, it's her third time, and the fact that the guy who created this award was once her childhood best friend is something she cannot let go of. 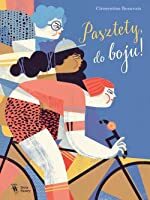 These three girls decide to go to Paris with their bikes — and Hakima's brother, Kader, who is going with his wheelchair — to attend a garden party at the Élysée. How are they going to fund this trip? By selling black, white, and vegetarian pudding. How ironic. This book was extremely funny, it made me laugh a lot, that was unexpected but nice. I enjoyed the girls, and I liked Kader as well, I liked their relationships. It wasn't a groundbreaking story, it had some ableist language and I didn't always agree with what it said about feminism, but it set an interesting discussion on how fat people are being perceived and discriminated against in our society. It honestly was a sweet story, I had such a good reading time! I'm not sure I'd reread it, but it's definitely a book I see myself recommending in the future! I came across this on BookTube and it looks soooo cute. Also I highly recommend the Cook Read Create channel on YouTube. Mands, aka The Bookish Manicurist, aka one of my favorite people ever, is one of 3 people I trust implicitly for book reviews and I love that she's vlogging on the regular now. I've already added 3 books based on her June wrap up alone. Just FYI, the other two books I added are: A Cardboard Palace and How to Bee. Écouté en livre audio. Super drôle ! This was a rather random pick for me. I was thinking I needed to read more books that take place outside the US, and what better than a book set in France written by a French author. I must say, I am very pleased I chose this book. "I don't understand why you insist on calling yourselves the Three Little Piglettes," Mum groans. "It's a horrible name." "We'll make it beautiful, you'll see. Or better, we'll make it powerful." I have heard people talk about this reclaiming. Taking back something that This was a rather random pick for me. I was thinking I needed to read more books that take place outside the US, and what better than a book set in France written by a French author. I must say, I am very pleased I chose this book. I have heard people talk about this reclaiming. Taking back something that was meant to hurt you, and turning it into something empowering. That is what Mireille did. When she medaled in the Pig Pageant for the third year in a row, she banded together with the gold and silver medalists to take back the term "piglet" and make it into something powerful. I was all onboard this girl-power trip, and loved the message. I also really loved Mireille. She was witty, amusing, and a little snarky. She loved poking the bear when it came to her mom, but when it came down to it, she had nothing but love for her. In fact, she just wanted more for her. Mireille had a lot of growth during this story, and I always expect that in a good YA book. Both Astrid and Hikima added to the fun. The three could not have been more different from each other, but I love that this wonderful friendship came from something so awful. I also thought it was so sweet the way Astrid and Mireille took on the roles of big sister to Hikima. Mireille was not quite as warm and fuzzy as Astrid, but she had a heart of gold underneath it all, and there were many decisions she made which support this. I kind of loved the way Beauvais tied things up at the end. She gave a little something to all the main players - Mireille, Astrid, Hikima, Kader, Mireille's mother and step-father. I am a sucker for a happy ending and I got that plus a great deal of closure. Overall: A delightful coming-of-age road trip, which made me laugh and warmed my heart. **I would like to thank the publisher for the review copy. Je m'étais gardée cette lecture pour l'été et j'ai bien fait! La plume de Clémentine Beauvais est assassine et tellement drôle, elle touche et pique. Bref on s'en tord les boudins ! Ce livre retrace le road trip complètement déjanté de trois adolescentes qui ont été nommées "Les trois Boudins" par leur (gentils) camarades de classe. L'auteur aborde ici des thèmes graves dont nous avons l'impression de ne pas maitriser et tourne le tout en dérision. Le tout est très léger et agréable à lire. Une cho Je m'étais gardée cette lecture pour l'été et j'ai bien fait! Grappig en hartverwarmend jeugdboek over drie meisjes die niet in hun slachtofferrol kruipen nadat ze op sociale media uitgeroepen worden tot "lelijkste meisjes van de school" . Wat volgt, is een meeslepende roadtrip naar Parijs waarin samenhorigheid en creativiteit centraal staan. Mooi! Piglettes is an adorable and inspiring novel. I would love to share this one with my younger self. Mireille is angry that she got bronze on the schools yearly Ugly list. For the past two years she's won gold, and this year someone took away her #1 spot and now she's in third. Marielle knows how to deal with being called names, and she doesn't let that affect her. But when she confronts the first and second place winners, she realizes that they are not as easy going as her. The three girls band to Piglettes is an adorable and inspiring novel. I would love to share this one with my younger self. Mireille is angry that she got bronze on the schools yearly Ugly list. For the past two years she's won gold, and this year someone took away her #1 spot and now she's in third. Marielle knows how to deal with being called names, and she doesn't let that affect her. But when she confronts the first and second place winners, she realizes that they are not as easy going as her. The three girls band together, and against all odds they plan a bike trip to Paris, proving everyone who said they couldn't do it wrong, the three girls embark on their trip, each for a different reason. I am a huge supporter of books written in other languages being translated to English. We definitely need more of that, and I was stoked to be able to review this book. I instantly fell in love with the characters, the story and the message this book was sending. It has such beautiful writing, but its done in a way where the reader can laugh along with the main characters. I love that this book had diversity in it, and dealt with some really important issues, such as bullying, family problems, and wounded soldiers. This book was meant for early highschoolers and the 15 years of age group, but some of the things the author talked about were very mature and I am so glad she did it in a gentle way where its easy for people to understand. While I really did love the message of the story and the characters. There were parts of the story that seemed to drag on quite a bit, and there wasn't a lot of action or excitement, the book is mainly focused on character development of all three girls and their chaperone. I definitely recommend giving this book a read, it will make you laugh and your heart swell with joy. Best of luck to the author, I hope to see more books like this in the future. 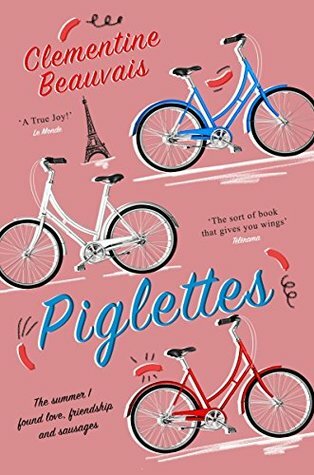 I came across Piglettes when I was in the library one day and after a quick read of the synopsis and discovering that it featured a group of girls going on a bike roadtrip to Paris, I knew I had to read it! I visited Paris a few years ago myself and absolutely loved it! So, I was looking forward to being reminded of the city. During the beginning of the book we find out that three young girls, Mireille, Astrid and Hakima have just been voted the three ugliest girls in school by their classmat I came across Piglettes when I was in the library one day and after a quick read of the synopsis and discovering that it featured a group of girls going on a bike roadtrip to Paris, I knew I had to read it! I visited Paris a few years ago myself and absolutely loved it! So, I was looking forward to being reminded of the city. During the beginning of the book we find out that three young girls, Mireille, Astrid and Hakima have just been voted the three ugliest girls in school by their classmates on social media. After this the girls come together and decide they want to make a stand and the best way to do this is to attend a national event in Paris and make their voices heard. - The plot is essentially quite simple which made the book easy to follow and understand. - The author isn't afraid to discuss/bring up controversial topics, such as online bullying, weight, periods, disability and I really appreciated this. - I loved the bike roadtrip aspect of the book, it was so interesting learning more about France and its culture. - The book focuses on giving a positive message to readers - which is "that what's inside is more important than what you look like on the outside." - Although, the ending was good, it did confuse me a little. I'm still not entirely sure if the President's partner knew exactly who Mireille was. L'un des très bons romans jeunesse lus ces dernières années! Thank you, Pushkin Children's Books, for my advanced review copy of Piglettes. I decided to DNF Piglettes by Clémentine Beauvais at 21 %, after having finished chapter 7 of the advanced reader’s copy. When I started Piglettes I was intrigued by the idea and the synopsis. However, once I started it I quickly realized that this book was just not for me. While the synopsis had intrigued me when I first read it I no longer felt the same excitement over the book’s concept as I had the first time I enc Thank you, Pushkin Children's Books, for my advanced review copy of Piglettes. I decided to DNF Piglettes by Clémentine Beauvais at 21 %, after having finished chapter 7 of the advanced reader’s copy. When I started Piglettes I was intrigued by the idea and the synopsis. However, once I started it I quickly realized that this book was just not for me. While the synopsis had intrigued me when I first read it I no longer felt the same excitement over the book’s concept as I had the first time I encountered it. Moreover, the writing style and the character voice did just not work for me. I don’t know if it has to do with the fact that this novel was written in French before it was translated to English or if it’s just how it’s written but it didn’t work for me. The same goes for the humor. There were a lot of moments I could tell were supposed to be funny but I just couldn’t feel myself connecting or relating to them. Despite all of this I can imagine this book being a hit for someone else, especially since it’s young adult contemporary read with a focus on three girls ready to embrace themselves and their strength despite the negative experiences they have been through. J'ai aimé le côté humoristique à travers lequel le harcèlement des personnes obèses chez les ados (ici, par la désignation sur FB des boudins d'or, d'argent et de bronze) est traité. L'histoire n'est pas du tout triste, au contraire ! On sourit à chaque page, en découvrant notre narratrice, Mireille, sacrée "boudin de bronze", parler de son obésité et de la manière dont elle gère le regard des autres. Même si elle n'aime pas son corps, même si elle est critiquée, elle prend la vie du bon côté en J'ai aimé le côté humoristique à travers lequel le harcèlement des personnes obèses chez les ados (ici, par la désignation sur FB des boudins d'or, d'argent et de bronze) est traité. L'histoire n'est pas du tout triste, au contraire ! On sourit à chaque page, en découvrant notre narratrice, Mireille, sacrée "boudin de bronze", parler de son obésité et de la manière dont elle gère le regard des autres. Même si elle n'aime pas son corps, même si elle est critiquée, elle prend la vie du bon côté en se disant que cela ira mieux plus tard une fois adulte ! Elle agit comme une grande soeur bienveillante auprès d'Astrid et Hakima qui n'ont pas encore ce recul par rapport aux critiques des gens. J'ai aimé l'idée de ce voyage en se gaussant de leur appelation de "boudins". Ca faisait un moment que je n'étais pas tombée sur une telle pépite de littérature jeunesse ! Clémence Beauvais adresse la grossophobie et le harcèlement avec une justesse et une fraîcheur qui font mouche, en abordant au détour d'un dialogue tous les problèmes de notre société (racisme, sexisme...), sans faux semblants. Plus qu'une sympathique comédie servie par le ton de son héroïne cynique et charismatique, Les Petites Reines est une belle histoire d'amitié et d'empowerement ! A mettre entre to Ca faisait un moment que je n'étais pas tombée sur une telle pépite de littérature jeunesse ! Le personnage de Mireille est formidable! Frais, drôle et moderne, j'ai passé un excellent moment avec ces 3 petites reines ! J'ai aimé le ton décomplexé de l'auteur, ses piques acidulées, ses références, ses prises de position et surtout, la place qu'elle donne à l'intelligence et à l'humour de jeunes filles face au harcèlement et aux diktats sociaux. Une ode à la bonne humeur, indispensable à la construction d'adolescent(e)s ! Ce roman est tout simplement FORMIDABLE. Je ne suis pas une très grande lectrice de littérature jeunesse, mais je me suis plongée dans celui-ci comme si ma vie en dépendait (j'exagère à peine). Les petites reines ce sont donc trois jeunes filles, plutôt moches qui sont élues boudins de l'année par le petit macho du lycée. Plutôt que de se laisser démonter par ce titre cruel, elles deviennent amies, et partent en mission, à vélo sur les routes de France en vendant rien de moins que du boudin pour Ce roman est tout simplement FORMIDABLE. Je ne suis pas une très grande lectrice de littérature jeunesse, mais je me suis plongée dans celui-ci comme si ma vie en dépendait (j'exagère à peine). Les petites reines ce sont donc trois jeunes filles, plutôt moches qui sont élues boudins de l'année par le petit macho du lycée. Plutôt que de se laisser démonter par ce titre cruel, elles deviennent amies, et partent en mission, à vélo sur les routes de France en vendant rien de moins que du boudin pour financer leur voyage. Sur la route elles croisent bien sûr quelques pépins, mais surtout, elles découvrent la force de l'union, de l'amitié et de la confiance. Clémentine Beauvais a un excellent sens de l'humour et une écriture hors de l'ordinaire. Loin de se la jouer pédagogue, elle parle d'intimidation avec beaucoup d'ironie et c'est franchement rafraîchissant. Ce roman est une perle de littérature jeunesse, clairement le coup de cœur que je n'attendais pas ! Clémentine Beauvais aborde avec une justesse rafraîchissante la grossophobie et le harcèlement (scolaire et en ligne), en y glissant également quelques remarques pertinente sur le sexisme, le racisme, la représentation... Le tout est enrobé par une histoire pleine d'humour, de mignonnerie et d'empowerment, et porté par des héroïnes fabuleusement attachantes. Oh that was outrageous! And outrageously funny. I am still snorting at Mireille's antics! Premier coup de coeur de l'année ! J'adore l'originalité et l'écriture de ce roman. Loved this book! It's a tough world for kids with social media these days and these girls overcome the hatred! Piglettes by Clementine Beauvais tells the story of 3 teenagers as they embark on a bike ride across France, as they become friends after being voted the ugliest girls in their school. This story is full of adventure, surprises and hope, all held together with a blossoming friendship that is heartwarming to follow. Recently, I have seen quite a lot of hype about this book and I wasn’t disappointed. This book is such a light-hearted, funny read, despite the serious nature that online bullying is. Mireille is a fantastic narrator and along with Astrid and Hakima have their own distinct personalities, which is interesting to read as they learn and develop over the course of the book (their journey). Each of the three girls have their own reason as to why they want to cycle all the way to Paris and get to Elysee Palace for the 14th July – with the whole book anticipating upto this event. We follow the journey to Paris with them, as they stop at various towns to sell their homemade sausages to raise funds for the cost of the journey itself. The journey to Paris is where we get to know the girls a little better, and where various events arise and make this story such an adventure. “The Piglettes” soon become a famous trio where they have captured the media’s interest and it becomes something that the three of them have to endure and manage, despite their very shy nature and low confidence. Again, it’s clear to see their development over the novel and how their friendship helps them overcome – even celebrate – their embarrassment of being voted the ugliest girls in their school. It offers hope in response to online bullying and highlights the importance of female friendships and supporting one another. I’d definitely recommend this book! It’s a little different to most YA out there in that it is a book that will make you constantly chuckle, despite the serious topics it covers within it. The French setting is beautiful and the characters are endearing and captivating. This fairly quick read has become one of my favourite YA books I’ve read this year and I can’t wait to see what Clementine Beauvais has written next! What a bizarre little ride. It felt totally uneven, with nearly no character development, but it was so strange and out of left field (and also funny) that I kept going. I was born in Paris in 1989 and though I started to read children’s books pretty early, I somehow never stopped. As a result, I’ve become a writer, reader and student of children’s literature. I’ve now been living and studying in Cambridge (UK) for seven years and have become a doctor. Well, not the type that saves people’s lives. The type that scribbles ‘PhD’ after their name and rambles on about I was born in Paris in 1989 and though I started to read children’s books pretty early, I somehow never stopped. As a result, I’ve become a writer, reader and student of children’s literature. I’ve now been living and studying in Cambridge (UK) for seven years and have become a doctor. Well, not the type that saves people’s lives. The type that scribbles ‘PhD’ after their name and rambles on about beauty, truth and the value of (all) literature. Worth striving for, I think! More about my academic work here. “Valérie: "You know, you don't need to be a lesbian to be a feminist. Nor do you need short hair to be a lesbian. Or a feminist."